ARTIST BIO: An ever-expanding career of ramshackle grandeur. 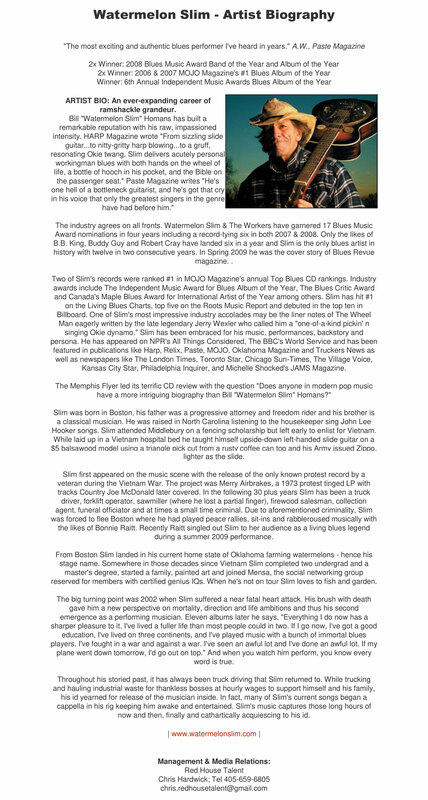 From Boston Slim landed in his current home state of Oklahoma farming watermelons – hence his stage name. Somewhere in those decades since Vietnam Slim completed two undergrad and a master’s degree, started a family, painted art and joined Mensa, the social networking group reserved for members with certified genius IQs. When he’s not on tour Slim loves to fish and garden. The big turning point was 2002 when Slim suffered a near fatal heart attack. 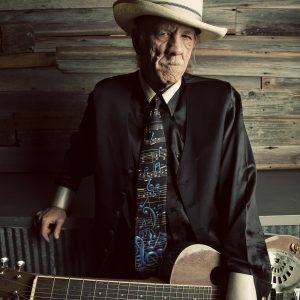 His brush with death gave him a new perspective on mortality, direction and life ambitions and thus his second emergence as a performing musician. Eleven albums later he says, “Everything I do now has a sharper pleasure to it. I’ve lived a fuller life than most people could in two. If I go now, I’ve got a good education, I’ve lived on three continents, and I’ve played music with a bunch of immortal blues players. I’ve fought in a war and against a war. I’ve seen an awful lot and I’ve done an awful lot. If my plane went down tomorrow, I’d go out on top.” And when you watch him perform, you know every word is true. Throughout his storied past, it has always been truck driving that Slim returned to. While trucking and hauling industrial waste for thankless bosses at hourly wages to support himself and his family, his id yearned for release of the musician inside. In fact, many of Slim’s current songs began a cappella in his rig keeping him awake and entertained. Slim’s music captures those long hours of now and then, finally and cathartically acquiescing to his id. Error: Error validating access token: Session has expired on Sunday, 27-Jan-19 17:57:45 PST. The current time is Tuesday, 23-Apr-19 18:02:25 PDT.